Community Witness Update - It's time to jump on board - The next round starts soon on Mai, 1ststeemCreated with Sketch. the second round of the Community Witness will finish on Mai, 1st and all accounts who joined before April, 1st will be payed out a share of producer rewards gained this month. You can do it using the "Vote for witness" Link scroll down to the text input field, enter steemhq.witness and hit the "Vote" Button. As alternative you can use this link and vote via Steemconnect. 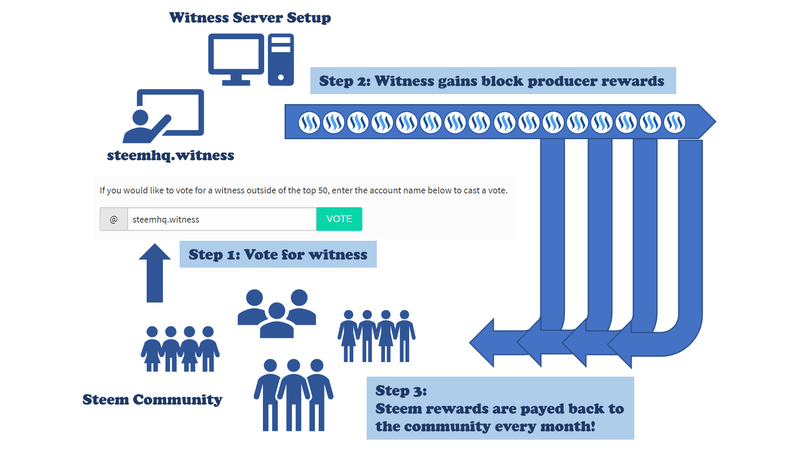 With enough votes from the community the witness server will start producing blocks on the Steem blockchain and earn Steem as a reward. After each month all earnings are payed back to the community proportional to your voting power which is equal to your Steempower. SteemHQ takes a small fee in order to cover the expenses for the project. If you already a member of the Community Witness, please don't forget to vote for Witness Parameter. Last but not least! Community Bot incomming! We just started beta testing another feature called Community Bot - it's already live! How does the Community Bot work? All Steem acounts which voted for the Community Witness steemhq.witness will get free upvotes from the Community Bot. Voting frequency and weight depends on many accounts are participating, however we guarantee at least one upvote each weak for each account! Accounts who are blacklisted on this blacklist will receive no upvotes from the bot. We will make use of all upcomming post rewards from @steemhq in order to power up the bot and give you even more reasons to join! More details on this feature will be covered in an upcomming post - stay tuned! It looks to be a similar thing . I haven't seen a payment for my witness vote from you yet though. How does that work? Your account did not reach that yet. But you will get payed. Is it based on my sp? Yeah, your payout is proportional to your stake of SP. How are payouts calculated and when are balances payed? At the beginning of each month a snapshot of all accounts who voted for the witness is taken. Depending on how much Steempower you hold at this time, your proportional share of all earnings for this month is calculated. You can always check the data right here. Payout for each account automatically happens on the 1st of each month for all earnings accumulated the month before. I know it can be frustrating for minnows who doesn't have large stake of SP, that's why we introduced the Community Bot - you'll receive at least upvote each weak just for participating - your SP doesn't matter in this case - everyone is treated equal. Are you and @isnochys the same person? You really are a great inspiration - yeah! I approved you as a witness. One upvote per week is acceptable for me. I planned to post only one per week. Could you tell me when will you start next season. You join the upvoting cycle immediately after your witness vote. All community members get upvotes in alphabetical order of the account name. Just yet we are at letter "m" so you can expect the first upvote pretty soon. where can I find a good explanation of the "Vote for Witness Parameter"? I already voted for steemhq.witness as a witness but I don't get the idea of this "Vote for Witness Parameter" ... what is it good for after I already gave the witness vote? This post has been just added as new item to timeline of SteemHQ.com - Community Witness on Steem Projects. If you want to be notified about new updates from this project, register on Steem Projects and add SteemHQ.com - Community Witness to your favorite projects. @steemhq, sorry to see you have less Steem Power. You made more than 8500 comments. Your next target is to reach 9000 comments. You made more than 9000 comments. Your next target is to reach 9500 comments. You made more than 10000 comments. Your next target is to reach 11000 comments. Voted you as a witness. You made more than 12000 comments. Your next target is to reach 13000 comments. Congratulations @steemhq! You received a personal award!